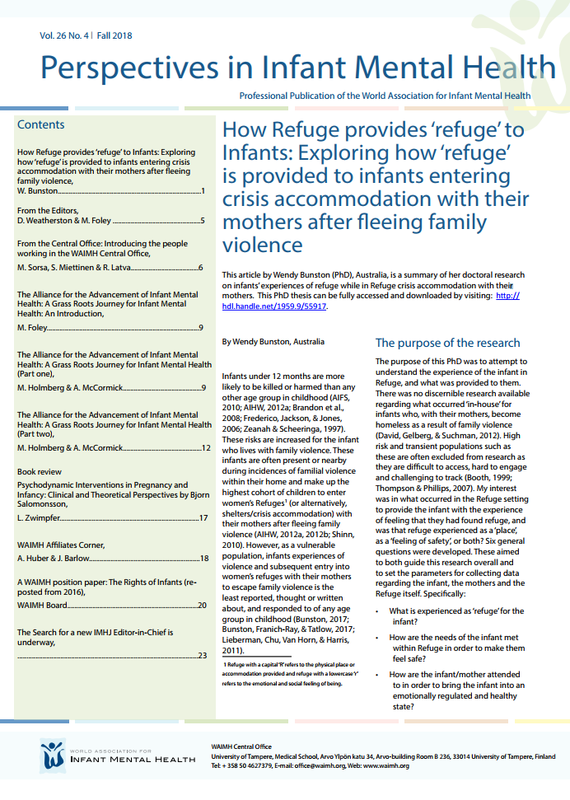 How Refuge provides ‘refuge’ to Infants: Exploring how ‘refuge’ is provided to infants entering crisis accommodation with their mothers after fleeing family violence, Bunston, W.
From the Editors, Weatherston, D. & Foley, M.
From the Central Office: Introducing the people working in the WAIMH Central Office; Part I, Part II and Part III, Sorsa, M., Miettinen, S. & Latva, R.
The Alliance for the Advancement of Infant Mental Health: A Grass Roots Journey for Infant Mental Health: An Introduction, Foley, M.
The Alliance for the Advancement of Infant Mental Health: A Grass Roots Journey for Infant Mental Health (Part one), Holmberg, M. & McCormick, A. The Alliance for the Advancement of Infant Mental Health: A Grass Roots Journey for Infant Mental Health (Part two), Holmberg, M. & McCormick, A. Book review: Psychodynamic Interventions in Pregnancy and Infancy: Clinical and Theoretical Perspectives by Bjorn Salomonsson, Zwimpfer, L.
WAIMH Affiliates Corner, Huber, A. & Barlow, J.